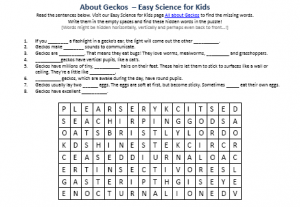 Geckos Word Search Puzzle – Download our printable FREE science comprehension worksheet for kids. This easy science word search puzzle is ideal for preschool kids, Kindergarten kids & Grammar school kids in Grades One to Five. Kids of all ages can enjoy our Geckos word search puzzle game! Grammar & Elementary school kids can use this fun missing word search puzzle as a reading comprehension worksheet. Pre-K kids & Kindergarten kids can enjoy this easy science comprehension worksheet as a listening comprehension activity while learning fun facts about Gecko lizards. Parents homeschooling their kids can spend quality time with their kids awakening their natural curiosity about science by teaching them fun facts all about geckos for kids. Educators can use our free science worksheet to supplement science classes and after school enrichment programs. Our website has many easy facts about animals for kids and many more free to download and print science worksheets and word search puzzles for kids. Geckos are reptiles and belong to the lizard family. There are over 1,000 species of Geckos in the world. They love eating bugs, worms, mealworms and grasshoppers. These amazing lizards store food in their tails. You can learn all about Geckos for kids on our Gecko fact page on our site. Download our free fun word search puzzle about Geckos! [sociallocker]Download our free science comprehension worksheet about the gecko. Download the FREE Geckos Word Search Puzzle for Kids! Did you like the FREE Geckos Science Worksheet? Read lengthy information about Geckos here. Declan, Tobin. " Geckos Word Search Puzzle - Free Science Comprehension Worksheet - ." Easy Science for Kids, Apr 2019. Web. 25 Apr 2019. < https://easyscienceforkids.com/geckos-word-search-puzzle-free-science-comprehension-worksheet/ >.